One reason we hear why people delay filing for bankruptcy is embarrassment. They don’t know anyone who has filed for bankruptcy and are afraid to admit that they are having financial difficulties. However, more people have filed for bankruptcy protection than you might imagine. And some very famous people sought bankruptcy protection for debts far in excess than what you probably owe. Read on for our list of four famous bankruptcies. Actress Kim Basinger filed for bankruptcy protection in 1993 despite having a net worth in excess of $5 million. Unfortunately for Basinger, she had gigantic business debts stemming from her backing out of a movie, which cost her almost $4 million to settle the dispute. 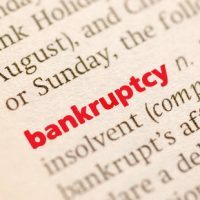 Basinger’s bankruptcy is a reminder that many people need to file because of business debts and not because they are extravagant spenders. Singer Cyndi Lauper has experienced tremendous financial success. However, it was not always that way. In 1981, Lauper filed for bankruptcy, a few years before her big break. Now, Lauper has an estimated net worth of $30 million. As Lauper’s history shows, filing for bankruptcy is not a sign that your financial future is over. Instead, fairer weather is just over the horizon. In July 1991, Trump filed for bankruptcy protection for his Taj Mahal. Two casinos entered bankruptcy in 1992. The Plaza Hotel in New York entered bankruptcy protection in 1993. Trump Hotels and Casino Resorts sought bankruptcy protection another time in 2004 for $1.8 billion in debt. Trump Entertainment Resorts entered bankruptcy protection in 2009. Having filed for six business bankruptcies, Trump has not only continued to grow his businesses but was also elected President of the United States, with many voters praising his financial savvy. There is no better proof that filing for bankruptcy does not diminish your standing in other people’s eyes. The rapper filed for bankruptcy protection in 2015 with total debts listed between $10-50 million. 50 Cent also reported assets worth the same amount. Among the liabilities was a $5 million verdict awarded to a woman who sued over a lewd tape that was posted online without her permission. 50’s bankruptcy filing was a surprise because his net worth had been estimated as more than $150 million. Nevertheless, his filing stands as a testament that financial difficulties can strike anyone and that there is no shame in seeking bankruptcy protection. If you find yourself awake at night, worried about your debts, then it is time to be proactive and address the debt head on. At Nowack & Olson, we have helped thousands of consumers and small businesses get their financial houses in order by filing for bankruptcy protection. If you would like to learn more about your options, please contact us for a free, no risk consultation by calling 866-907-2970 or submitting an online message.